At least 26 people have been injured at a theme park in Spain after two train cars collided on a rollercoaster. The accident occurred when a car completed a loop and failed to stop, crashing into the back of another car. An emergency services spokesman said: "There are 26 injured as of now, all of them lightly, mostly bruises. "The patients are being taken to hospital to be examined more thoroughly." 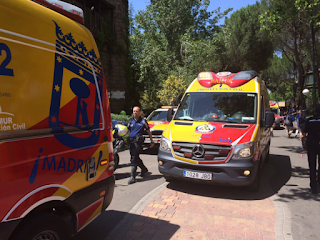 The accident took place on the TNT Tren de la Mina rollercoaster at the Parque de Atracciones in Madrid, one of Spain's oldest theme parks. The rollercoaster reaches a height of 17.5 meters and travels through waterfalls at a maximum speed of 35mph, according to the theme park's website. The Parque de Atracciones opened in 1969 in Casa de Campo, the largest park in the Spanish capital.